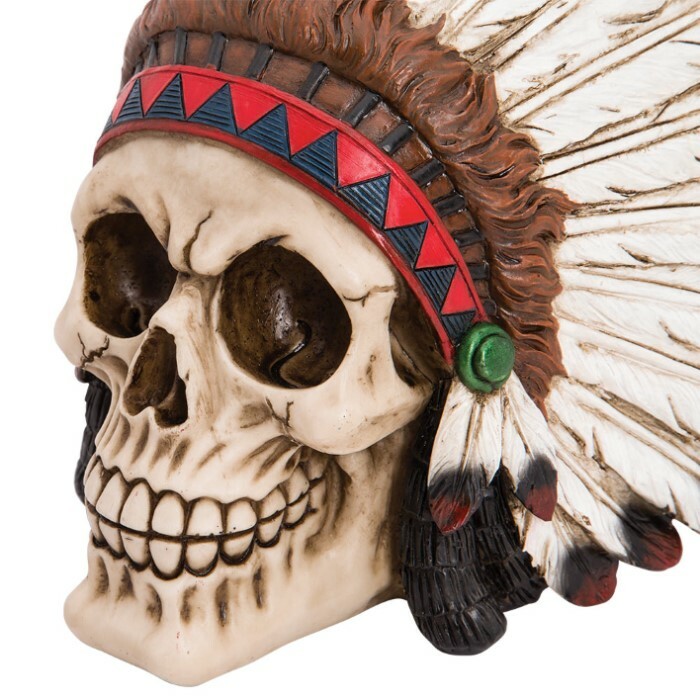 Even in death, the Native American portrayed in the Indian Brave Chieftain Skull looks fierce and ready for battle. His bony brow is furrowed in anger and resolve, and his stately feathered headdress bears the elaborate, elegant earmarks of a revered Indian Warrior-Chief. Forged with tough cold cast resin, the intricacy and attention to detail in this stylized sculpture is nothing short of astounding. 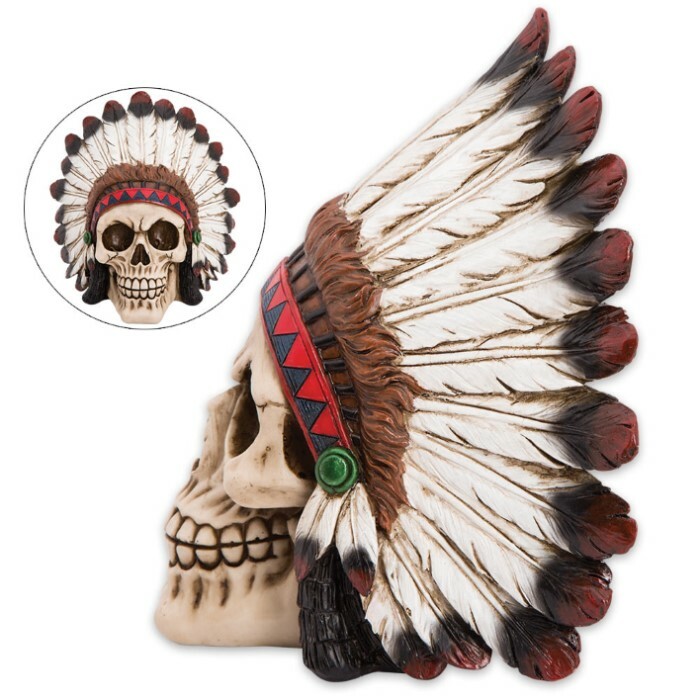 The skull bears authentic-looking fractures, and the headdress is exquisitely painted in vibrant reds, blacks, whites and brown, beautifully highlighting the extraordinarily realistic patterns and textures in the feathers. 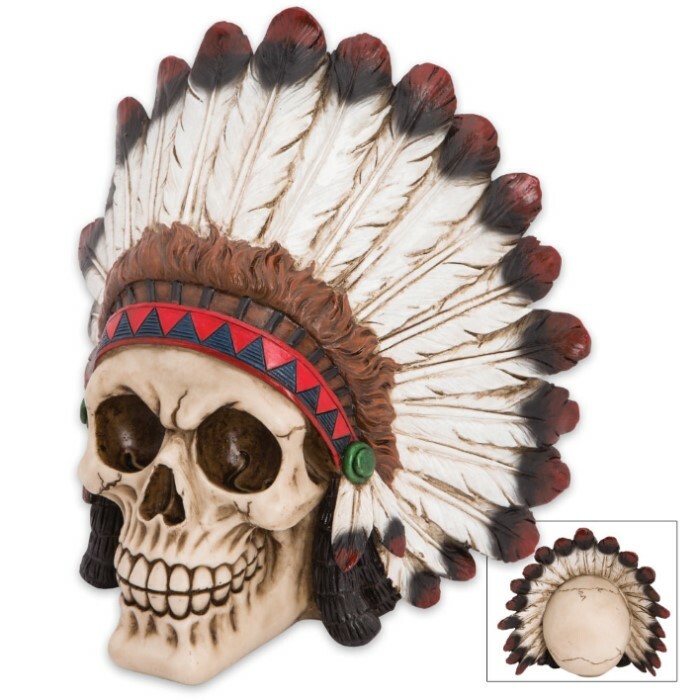 If this Indian Brave skull were any bigger, you’d think it was the genuine article! Looks fantastic displayed anywhere – a mantle, bookshelf, desk, curio case, office table and more. Makes a handsome tribute to the Native American warrior spirit, no matter where you plant it. Measures approximately 8” high x 7 1/2” wide x 5” deep.